According to a recent press release from Porsche, the automaker is looking to the future with plans to integrate blockchain technology into its cars. Porsche is one of many companies capitalizing on the popularity of blockchain around the world. As a testament to just how popular this is becoming, Kodak films recently helped launch KodakCoins which is a cryptocurrency aimed at helping photographers and agencies secure and manage image rights. The blockchain is an essentially incorruptible digital ledger originally created for cryptocurrency Bitcoin. Now, we see other applications popping-up constantly as the technology is being programmed to record almost any information of value securely. Many tout the blockchain technology as one of the most ground-breaking inventions since the internet. While that may sound like a stretch for something you haven’t heard much about yet, it is a pretty impressive piece of tech. Plainly put: the blockchain facilitates value exchange without the need for trust or a central authority. All these methods entail some level of trust and risk, which is not ideal. Instead of exchanging valuable information–like money–the blockchain technology does this same job with a few lines of code. The money is securely sent at the beginning of the agreement, and the program keeps it safe until previously agreed upon stipulations are met. The program would check that the work was completed and release the money only when appropriate. Before beginning, each party can review the contract logic, but once it’s running on the blockchain, it cannot be altered or paused. This is why it’s so secure. How will Blockchain Technology be used in cars? One such example is Porsche. 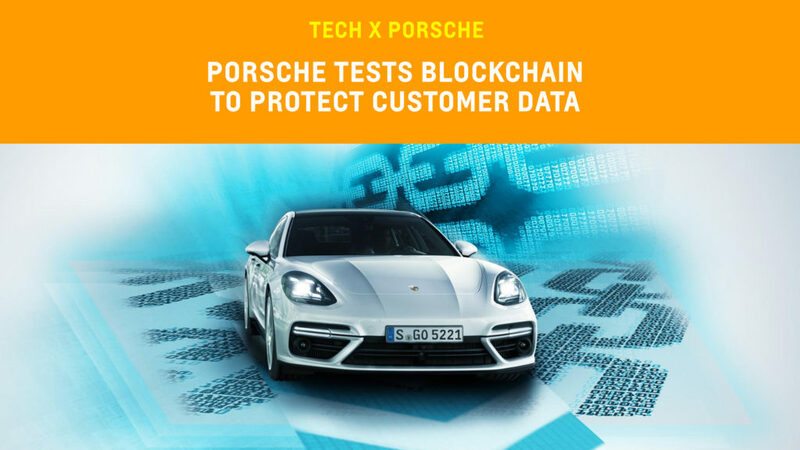 In partnership with Berlin-based startup XAIN, Porsche plans to use blockchain to keep customers’ financial information safe from hackers. Why? As cars have evolved into computers on wheels, they now connect with other vehicles and their environment regularly to exchange data. This trend is only going to continue. Porsche plans to use blockchain to automate services for customers and eliminate some of the more routine tasks involved with vehicle ownership. Over a three-month pilot project that ended at the end of last year, Porsche became the first automaker to test Blockchain technology successfully in a car. The pilot program included app keyless/remote entry, temporary access authorizations and testing new business models based on encrypted data logging that analyzes driving behaviour. With no data being transferred back and forth to a central server, blockchain promises security and speed that wasn’t possible before. Porsche claims that their tests of opening and closing a door via an app took only 1.6 seconds–up to six times faster than previously tested technology. These are relatively simple applications, but Porsche did say they would be developing more–and we already see the possibilities. When thinking about autonomous and electric cars, for example, a car using the blockchain tech could digitally and securely sign a contract to recharge its battery wirelessly, park, or complete a toll, while handling the accompanying payment for the driver. Blockchain would help transfer this data safely and protect the driver from potential hackers. The possibilities with blockchain are endless because it does not require a central server to exchange data. By using smart contracts, third-parties can easily integrate with the technology wirelessly, too. That means blockchain technology is capable of facilitating temporary access to a car securely. Imagine autonomous parcel deliveries that are able to grant temporary access and open for customers to retrieve a package. The blockchain is an expensive technology to use, but since debuting in 2009, the encryption algorithm that it uses has not been cracked. Porsche is looking to this technology in an attempt to stay ahead of changing times and keep their customers’ data safe. Will blockchain become a standard technology in cars in the next few years? There are a few other alternatives, but none have proven to be as effective or secure as blockchain. Drivers are craving more conveniences behind the wheel and hackers are savvier than ever. As of now, blockchain appears to be our most viable solution for protecting our data, while ushering in the age of autonomous tech.